The Chinatown Summer Events series will be held in the two and only outdoor public spaces in historic Chinatown - Chinatown Memorial Square and Dr. Sun Yat-Sen Courtyard. 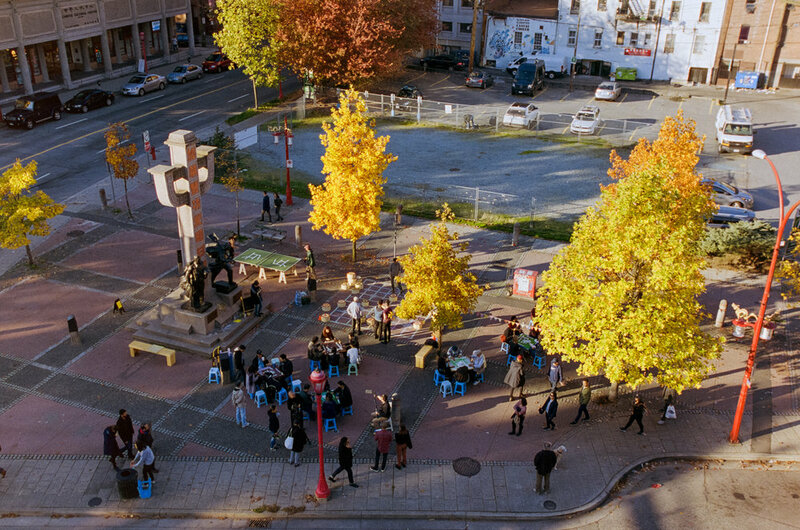 Learn more about these important neighbourhood-serving public spaces. The Chinatown Memorial Square is a central public space located at the intersection of Keefer St and Columbia St forming a key gateway to historic Chinatown. It was created in 2002 to pay tribute to the contributions of Chinese Canadian WWII soldiers and railway workers who built the national railroad of Canada. A monument shaped as the Chinese character “zhong” symbolizing moderation and harmony, stands in the plaza in their honour. A Remembrance Day ceremony is held every year at the square in honour of the veterans. In 2017, Vancouver City Council voted to redesign and expand the plaza as part of their formal apology towards historic discrimination towards Chinese people in Vancouver. The Dr. Sun Yat-Sen Courtyard sits in between the Dr. Sun Yat-Sen Park and the Chinese Cultural Centre. In the middle of the courtyard is a mosaic of the twelve animals in the Chinese Zodiac. The courtyard is a central public space in Chinatown used for special community events such as Canada Day celebrations. However, it is currently under-utilized on a regular basis. The Chinatown Summer Events series hopes to reactivate the space with regular cultural activities to inspire others to do the same.